A recent New York Times article argues that the failure of Western governments to recognize the latest presidential elections in Abkhazia on August 26, 2011 may hamper conflict resolution. According to the authors, Cooley and Mitchell, Western governments have a “counterproductive disdain” of developments in Abkhazia and isolating Sukhumi will reduce prospects for conflict resolution. The article also sparks a debate about the degree of democratic competition in Georgia and Abkhazia by saying that the recent elections in Abkhazia seemed to be fairly competitive by the standards of countries in the South Caucasus. This all comes at a time when popular perception in Georgia is such that the prospects for reintegration with Georgia have decreased over time and there is no preferred method for finding a solution to the conflict. According to the article, failure to recognize Abkhazia’s efforts to hold somewhat democratic elections is counterproductive in various ways. First, it unintentionally reinforces Russia’s growing influence in Abkhazia. Second, it “further entrenches the counterproductive position that nothing that happens in Abkhazia, or even the views of the people there, have any bearing on any potential resolution to the conflict” (New York Times, Aug 31 2011, "A Counterproductive Disdain"). This argument raises the question of the EU’s strategy of “engagement without recognition” since European governments have shown little engagement before and after Abkhazia’s presidential elections. In another article from 2010, the same authors point out that Russian-Abkhaz relations have dramatically changed since the 2008 war. According to their view, the ongoing delegation of basic state functions from Sukhumi to Moscow has further reduced prospects for conflict resolution. Russian troops guarding Abkhazian borders, the Russian ruble in the pockets of Abkhazians, and Russian telephone prefixes (+7) in the region are the most visible signs of this change. With all of these developments, have the prospects for conflict resolution changed? What do Georgian citizens think are the most important activities to solve the Georgia-Abkhaz conflict? According to CRRC’s 2010 Caucasus Barometer (CB), 41% of Georgians think the prospects of Abkhazia becoming an integral part of Georgia have decreased since 2008. 35% think prospects have stayed the same and only 9% believe prospects have increased (14% remain uncertain). Also, a 2010 survey among IDPs in Georgia by CRRC shows that 12% believe Abkhazia will be reintegrated with Georgia within the next 5 years. 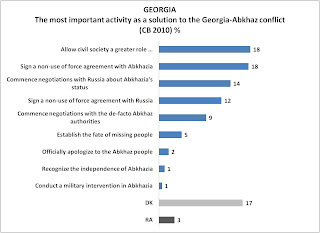 When asked what they think is the most important activity as a solution to the Georgia-Abkhaz conflict, 1% of Georgians says recognition of Abkhazia’s independence. An equal amount of the adult population (18%) say civil society should be given a greater role and that a non-use of force agreement should be signed with Abkhazia. A smaller proportion of the population thinks that commencing negotiations with Russia (14%) or signing a non-use of force agreement with Russia (12%) is the most important activity. It is important to note that 17% of Georgians are not sure what would be the most important activity. What do you think is the most promising approach to resolve the conflict? Do you think the prospects for resolution have decreased?